Schools and youth groups of 10 youth or more wishing to explore the Arboretum on their own may pre-register at a fee of $2.00 per person. School employees who accompany the group are not charged. The parking fee is waived for groups provided registration occurs a minimum of 10 days in advance. 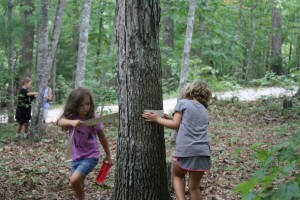 To schedule a visit contact Michelle Pearce, Youth Education Coordinator, at mpearce@ncarboretum.org or 828-665-2492 ext. 624. Groups must arrive at a predetermined time and will be met by a guide, who will provide suggestions for activities and provide a lunch location if needed. Our self guided visit includes: Meeting a designated staff member for check in when you arrive. At that time payment will be collected and any kind of directions regarding facility use and lunch location will be addressed. The staff will not remain with your group, but will meet you for lunch and assist with trash and recycling collection. *The guided hike visit includes: All of the above and a guided hike along one of our popular trails. For this hike small groups (20-30 students) are best and a rotation schedule can be set up prior. This is different from our guided field trip programs, and those will not be available during the summer due to lack of classroom space.